Treatment for Low Testosterone! Natural Testosterone Therapy! And you can bet that the big pharmaceutical companies absolutely love the doctors! Without them they wouldn't exist. 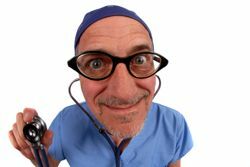 Think about your typical doctors visit for a minute. 30 minutes to an hour sitting in a crowded waiting room, followed by about 5 minutes with the doc. Here's your prescription buddy, you can pay at the door! If you go see a typical doctor about low T, what do you think is going to happen? Do you think he's going to work with you to get to the root of your problem? Chances are, there will be no discussion on exercise, diet, estrogen exposure, medications that are causing your problems, or much else! Here's what's going to happen! If you're over 30, he's going to recommend that you artificially boost your testosterone levels. And he's going to recommend that you do this for the rest of your natural life! Now I can understand this if you're on the short side of 70. When I get there, I'll be the first guy in line, waiting for my fix. But not at 50, or 40, and certainly not at 30! Start traditional T therapy in your 30's, and you'll be locked in for 40 or 50 years. There will be no turning back, because by that time, your testicles will have shrunk to the size of raisins. To make matters worse, you'll need to find a way to control conversion of testosterone into estrogen. You guessed it, a prescription med! The boys at big pharm are all smiling! 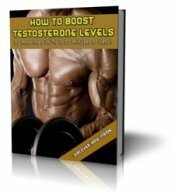 Natural Ways to Increase Testosterone! Want to save your testicles? Want to avoid hostility, mood swings, depression, acne, and gyno? Then don't go to the doc for testosterone replacement therapy until you absolutely have to. Hold of until you start approaching the age of 70 if at all possible.